(Santo Domingo, November 14, 2013) After showing a short video that compiled some of the main works of Jessy Terrero, the first Dominican to direct a film in Hollywood, he recommended that those who long to be directors get a good education and training. 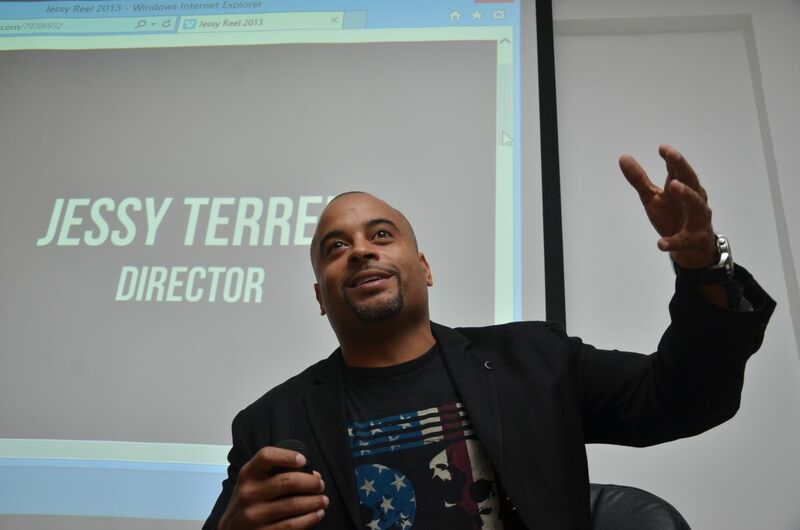 Terrero shared his experiences as a director during a chat with a group of students at the University APEC, as part of the program of activities for the 7th edition of the Dominican Global Film Festival (FCGD). In the dialogue with Advertising and Graphic Design students from the aforementioned university, Terrero recalled that he became a director by accident. “Most of the time my brothers and I stayed home alone and we made home videos,” he said. On Dominican soil Jessy Terrero had only worked under Juan Basanta. In the film Biodegradable he served as executive producer, since he thought that Basanta was doing something different. He said that in the next three years he has eight more films scheduled for shooting. As for his perspective on Dominican cinema, he feels that pounding out different paths is necessary. His extensive professional career includes productions with 50 Cent, Wisin y Yandel, Daddy Yankee, Paulina Rubio and Aventura. “When I finish my work, I’m happy; but sometimes not. But if the client is satisfied, that makes me happy,” he said. He added that the key is giving each individual artist what they need because each one has a different style. “As a Latino they pigeonhole you, but this doesn’t happen only in the United States; it also happens in Hispanic countries,” he said, explaining that despite the low budgets of some projects, it is possible to do good work. As a music video director, Terrero said he was satisfied. However, regarding his role as film director, he felt that he still had a long way to go. “It is possible to make a smooth transition from being a director of music videos to directing feature-length films,” he said. Jessy Terrero is an American director of Dominican decent who began his career working in music videos. To this day, he has worked with a variety of acclaimed artist including 50 Cent, Wisin y Yandel, Daddy Yankee, Enrique Iglesias, among many others. He marked his feature film directorial debut in 2004 with Soul Plane (MGM), starring Kevin Hart, Tom Arnold, Sofia Vergara and Snoop Dog, followed closely by Gun (Lionsgate), starring 50 Cent and Val Kilmer. Most recently, Terrero directed Freelancers (Lionsgate), starring Robert DeNiro, Forest Whitaker and 50 Cent. He is currently in pre-production for his next feature film, The Pursuit.